Clean Water for Haiti is one of the largest, consistently running bio-sand filter projects in the world. Since our start in 2001 we have installed over 24,500 filters, providing access to clean water at the household level for almost 2% of Haiti’s entire population. The best part? Over 95% of our filters are still in use after the first year. For about $100 US we can build a filter, deliver and install it, and provide a year of support to the family who owns it. On top of that, we get to provide full time employment to local Haitians. Your donations go a long way! We want Haitian families to know Clean Water for Haiti as a dependable source for household water filtration in Haiti. As we continue to work in a very focused way we want to keep doing what we do better, whether it’s within our filter program, or by making changes and developments within our programs and with the bio-sand filter itself that will help other projects around the world. Haiti is considered one of the most water impoverished nations in the world. We believe in empowering people. 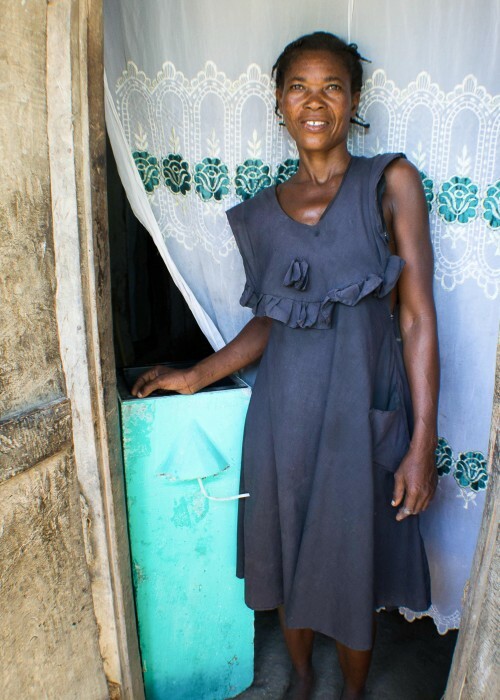 Bio-sand filters are a tool that enable Haitian families to gain some control over the water they have available and how it affects their personal health. We also believe that lasting change happens when people are part of the solution, so we’ve chosen to use a subsidization model for our filter program. Why subsidization? We want every family in Haiti have access to clean water, and most can’t afford to pay the full price for any filtration system. When families invest the small co-pay of about $5 US in their filter it becomes something of value. They’re more likely to use it and take care of it. We know our model works because over 95% of our filters are still in use after the first year. Education. It’s one of the most important development tools available. Every Clean Water for Haiti filter that gets installed comes with a year long education program for the family that receives it. After a filter is installed one of our technicians will visit the home at one month, three months and one year after installation. These visits are vital, and the key to our successful program. During home visits our technicians have the opportunity to reinforce user education and troubleshoot any confusion that the family might have, as well as talk about healthy sanitation and hygiene practices. They can also check on the condition of the filter and make sure that it’s working properly. If it’s not, they do any site repairs that they can. Anything that can’t be addressed during the follow up visit will be taken care of by our repair crew. These visits are done at no extra cost to the family buying the filter. Why? Because we believe education is a key to changing things for the better for future generations. When you donate to Clean Water for Haiti you’re investing in life change – and it’s not just about filters. We believe in supporting the local community, so we’ve worked hard over the years to build up a local work force. All of the day to day work within our programs is done by our trained Haitian staff with oversight from a few key full time in-country leadership staff. Most of our staff have been with us for years. We get the opportunity to see the life change that can come from having a full time job, and from having the opportunity to learn valuable job skills. We’ve seen these men become welders, mechanics, electricians, plumbers, drivers, foremen, and public health workers. Our staff are proud of the work they’re doing. They know they play a vital role in stopping the spread of water borne illness. They have the opportunity to serve their own communities and country, and they know they’re helping to change Haiti for the better. Employment brings dignity, and dignity brings change. Your donations to Clean Water for Haiti make an incredible impact – once to help people get access to clean water, and again by helping to provide full time employment. The majority of water sources in Haiti are contaminated. ~It’s a completely natural process that doesn’t involve any electricity, moveable parts, or things that need to be regularly replaced. ~It’s so simple to use that even children within the home can easily understand it’s operation and filter water. 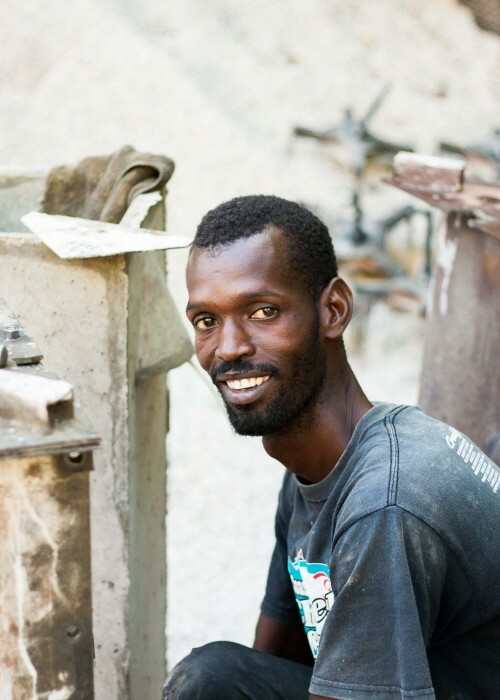 ~Our filters are the concrete design, so we can manufacture them in Haiti using local labor and locally sourced materials. ~Most of all, the Bio-sand filter can treat water from almost all available water sources – canals, piped systems, wells, rivers, etc. This means that people can use the water that’s available to them and end up with drinkable, safe water. ~It works with Haiti’s many cultural, physical, financial and resource challenges. It’s what we like to call an “appropriate technology” because it fits into Haiti, rather than Haiti fitting into a filtration system. WHAT IS A BIO-SAND FILTER?